An 11-year-old girl inspired by the Flint, Mich water crisis has been named “America’s Top Young Scientist” after she developed a device that can quickly detect lead levels in water. In Flint, elevated levels of lead were found in the city’s water supply after the city disconnected from Detroit’s water line as a cost-cutting measure and began drawing water from the Flint River in April 2014. Gitanjali, a seventh grader, also saw firsthand how complicated it can be to test water for lead by watching her parents, Bharathi Rao and Ram Rao, try to test the water in their Lone Tree, Colo., home. The website featured an article on new technologies used to detect hazardous substances, which Gitanjali figured she could adapt to detect lead. Gitanjali reached out to her parents, both engineers, her teachers and experts at local colleges and universities for help. Gitanjali spent months trying to convince local high schools and colleges to give her lab time to continue her experiment. At home, Gitanjali worked on her project in the “science room” she asked her parents to create for her when they moved from Tennessee to Colorado. 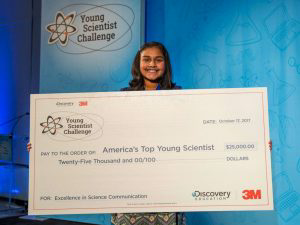 When Gitanjali was named one of 10 finalists in the 2017 Discovery Education 3M Young Scientist Challenge earlier this year, she was able to partner with a 3M scientist to help develop her innovation. The result is Tethys, a sensor-based device designed to detect lead in water faster than other techniques currently on the market. The device utilizes carbon nanotube sensors –- similar to the technology Gitanjali saw on the MIT website –- to detect lead. It can then send the results to a smartphone. Gitanjali presented Tethys to a panel of judges this week in a live competition at the 3M Innovation Center in St. Paul, Minn.
She was named the grand prize winner and received a $25,000 prize. The woman whom Gitanjali said inspired her to pursue science and follow her passion to develop the lead testing kit believes Gitanjali can do it. 0 Response to "11-Year-old Girl Wins $25,000 Science Prize For Creating A Cheap Device To Test Drinking Water For Poison"